This Mela polished chrome 6 light flush crystal ceiling light with aluminium rods is stunning and energy efficient. 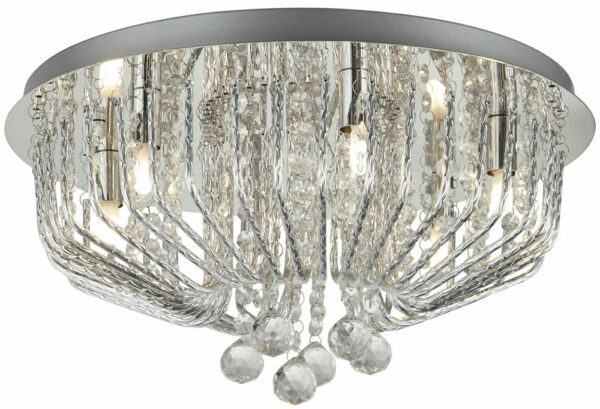 Featuring a circular flush mount and outer cage made from textured polished aluminium rods, mirror chrome fascia and masses of strung faceted crystal beads, with large faceted crystal balls hanging below for a bright sparkling light. The bright chrome, polished aluminium and large crystal galls combine to create a unique design that is perfect lighting for modern or contemporary rooms with a low ceiling. The dazzling array looks truly stunning when lit and catches the light when switched off making it ideal as a glamorous centre piece for any living room, dining room or bedroom. This contemporary light is supplied by Searchlight who manufacture some of the best traditional and modern classic designs such as the Mela polished chrome 6 light flush crystal ceiling light with aluminium rods you see here.